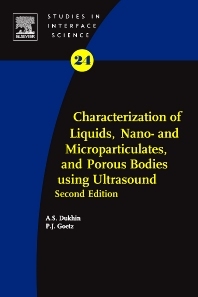 Two key words define the scope of this book: 'ultrasound' and 'colloids'. Historically, there has been little real communication between practitioners in these two fields. Although there is a large body of literature devoted to ultrasound phenomenon in colloids, there is little recognition that such phenomena may be of real importance for both the development and applications of colloid science. On the other side, colloid scientists have not embraced acoustics as an important tool for characterizing colloids. The lack of any serious dialogue between these scientific fields is the biggest motivation behind this book.